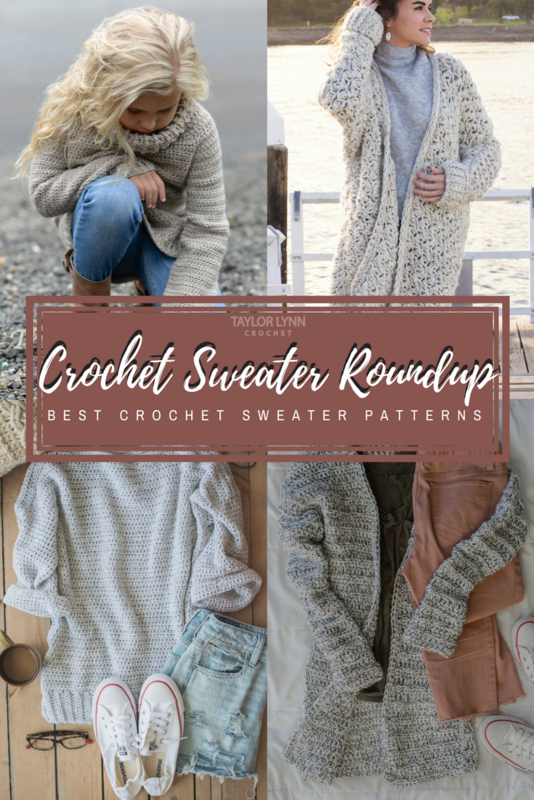 Whether it’s your first attempt at a crochet sweater, or if you’ve made 100 sweaters, having a good sweater pattern to follow is a must. 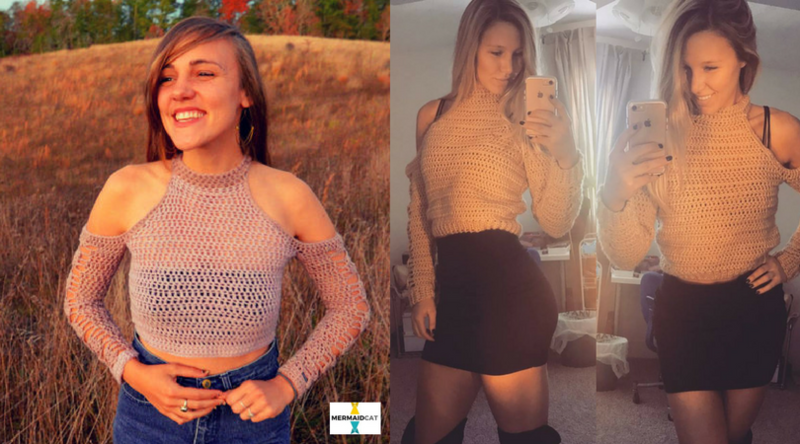 I have seen so many gorgeous crochet sweaters flooding my Instagram feed and I feel its my duty to share some of my top picks of these gorgeous patterns. I’ve had so many orders for my Claire Bun Beanies (pattern from A Crafty Concept) after I posted a few pictures to my Facebook, that I haven’t had as much time to work on new patterns. I have 9 more beanies still to make and ship out in the next week or so! These sales are a welcome bit of extra cash right before Christmas. With that being said, I didn’t want to leave you all hanging with no projects to work on so I made this awesome sweater pattern roundup to keep you busy until my next pattern release. I’m featuring some of my favorite patterns from some of my favorite makers <3 This maker community is all about positive vibes and constant support of each other and I wouldn’t have it any other way. 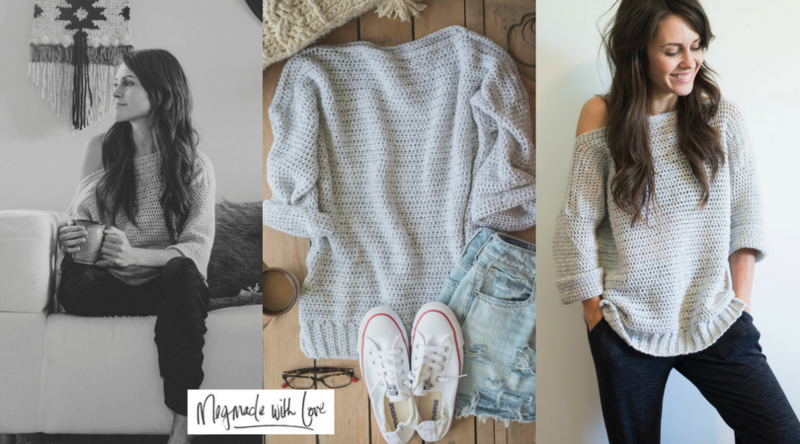 Meg from MegMade with Love has created this stunning textured Marley Cardi and it is to die for. Not only is this pattern free on her blog (the ad free PDF is available for $2.00 on Etsy), BUT she made the pattern in sizes XS-3XL! Anyone who has designed a pattern with multiple sizes knows how difficult that can be, but I am so glad she took that extra step for us all! If you don’t follow Meg on Instagram, I high recommend you do. She post the most real life snap stories and her photo captions never cease to put a smile on my face. 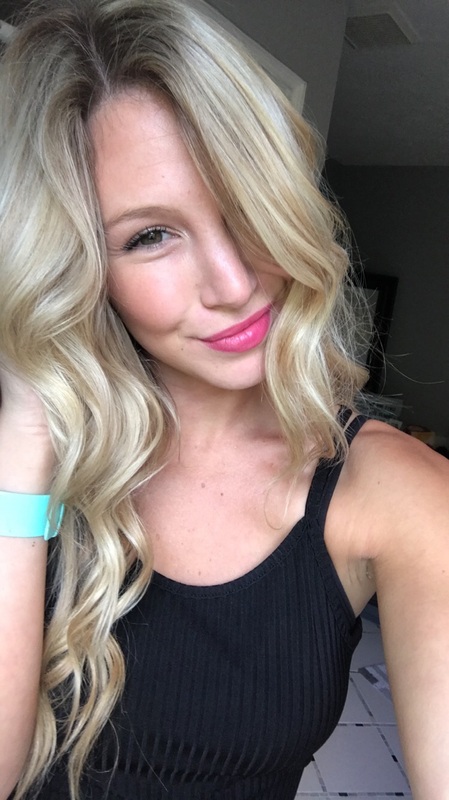 She is a total Gem to the maker community and her amazing blog is definitely worth browsing if you haven’t seen it yet. Olivia from Hopeful Honey is such an inspiring human. She really has a way of setting the scene with her photos which makes it easy for you to imagine what it will be like when you get to wear your finished projects too. 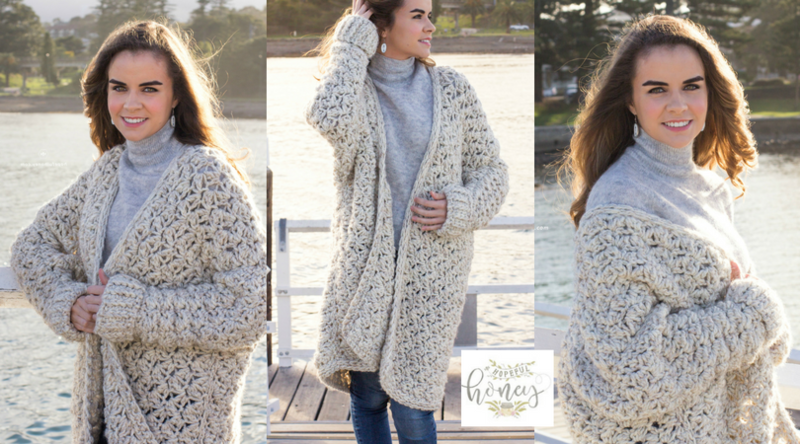 I just finished making this Coastal Fog Chunky Cardigan as a Christmas gift for a friend and I know she is going to love it. This cardigan works up super quickly despite how large in size it seems! This is the perfect cold weather garment for bundling up and keeping warm on these blistering cold days. Not only will it keep you warm, but you will look super cute as a bonus. Its really a win-win. You can purchase this pattern for $5.50 on Olivia’s Etsy. I cannot say enough good things about this pattern or this gorgeous amazing maker! I love this Encounter sweater so much that I made it TWICE (my fawn colored one is pictured above on the right!). Stacey from Mermaid Cat Designs is such a lovable free spirited woman, and it’s impossible not to fall in love with her designs. I went on Etsy looking to purchase just a single pattern, maybe two… and ended up with 7 patterns from her. She has everything from sweaters to dresses to swimwear patterns. There is really something for everyone. You can get this Encounter Sweater pattern for just $4.95 at her Etsy shop. She does offer bulk pattern discounts if you purchase 3 patterns you get 10% off, and the more patterns you buy, the bigger discount she offers! Once you see her patterns I’m confident you will want to buy them in bulk, so make sure you use her offered discount codes! If you follow a lot of makers on Instagram then you probably saw this sweater take over your feed when it was released. It is made up of simple basic stitches but has such a pretty end product. “Easy, Comfy & Cute” were how Meg described it and I think she hit the nail on the head with that. Again this is a FREE pattern on her blog which is amazing. She made the pattern for sizes S, M & L, but she made this pattern so easy to customize that it can be altered to fit any size.If you want the ad free PDF you can purchase that from her Etsy again for only $2.00. So if you have ever searched through Etsy for any new modern crochet or knit wearable patterns then you have probably seen Heidi’s work. She makes all her patterns in knit AND crochet versions. That is amazing. I am a novice at knitting to say the least, but I can’t tell you how many times I have seen a gorgeous knit wearable and wished there was a crochet substitute for it. Heidi from The Velvet Acorn acted as my crochet fairy godmother and made my dreams a reality. Not only are all of her patterns, the knit and crochet versions, absolutely stunning, but the photographs she takes of her adorable children wearing them makes you want to give her all your money for these patterns. I am almost (key word almost!) sorry that I am infecting all of you with with my Heidi obsession which will cause you to spend all your money on her patterns. They are so worth it though that I don’t even feel a little guilty about it 😉 This is her Portlynn Pullover modeled by her gorgeous little girl. It comes in sizes from 12/18month (baby) to 4XL and you can purchase the PDF from her Etsy shop for only $5.50. So basically you could make this cute little number for almost everyone you know! Another pattern from Heidi because like I said… I’m obsessed. She has over 400 patterns in her Etsy Shop available to purchase and I am not even scratching the surface of all the cute things she has to offer, but I really love how this Reminisce Sweater could be worn with so many outfits! With a pair of jeans and T like she has pictured, or over a cute dress and leggings.. the possibilities are endless. I could wear this cardi everyday honestly. Again this cardigan comes in sizes 1/2, 3/4, 5/6, 7/8, 9/10, 11/13, xsm, sm, med, med/large, large, xlarge, xxlarge, 3xlarge, 4xlarge which is pure insanity. The good kind. All of her patterns have what sizes they come in listed right in the titles to help you out. The amount of time and effort that goes into these patterns is tremendous and it shows. The best part is that Heidi also offers bulk discounts on her patterns so that is something to keep in mind when browsing her shop! Sweater weather isn’t a joke.. Thank you! Hopefully I can keep putting them out for you all!